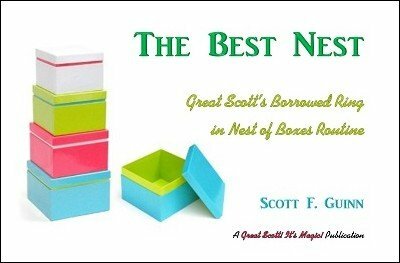 The Best Nest - Scott's Borrowed Ring in Nest of Boxes routine is an absolute treasure! One of his pet performance pieces, you can use the routine with virtually any existing marketed set, or make up the DIY set as Scott explains, and save hundreds, if not thousands, of dollars. Scott has honed this routine over decades of performances, and it shows. Every little detail and nuance is given, along with subtleties and convincers that you won't find anywhere else, including a really easy and really sneaky way of making the audience believe the nest of boxes has been freely and completely displayed on every side. As if all this were not enough, Scott includes his complete script, with all the byplay and bits of business that turn a simple trick into a powerhouse professional routine. If you perform parlor or platform shows, you will love (and use) this! The routine is very easy from a technical standpoint. If you can finger-palm a small object, you can perform The Best Nest . The nest of boxes is brought into view before the ring is vanished. Three different audience members participate in the routine. Very detailed instructions for constructing the nest are included, along with helpful photos illustrations, as well as sources for the required materials. The entire set with everything you need can be put together for under $50. If you already have some of the items (very likely, if you've been doing magic for any length of time), it will cost as little as $12-13! The prop construction and preparation can easily be completed in one evening. The resulting set will allow you to accomplish an effect as good or better than professionally prefabricated sets costing upwards of thousands of dollars. 1st edition 2016, 53 pages.